Fox Tossing is an excursion through some of the most appalling and amusing “sports” ever dreamt by man. 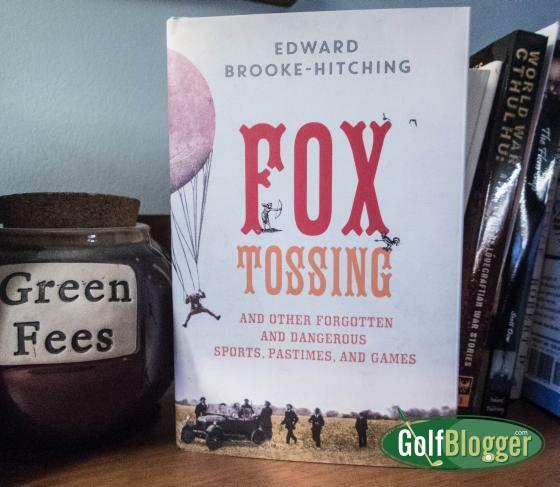 From aerial golf to porcupine slaughters to “baiting” of beast and man, author Edward Brook-Hitching has composed ninety short essays on the strangest of sports. The final death toll of one fox tossing match … came to a staggering 687 foxes, 533 hares, 34 badgers and 21 wildcats. Of interest to the golfer is the sport of “aerial golfing.” In this madness, dating to 1928, teams were composed of one pilot and one golfer. The pilot would buzz the course and drop the ball as closely as possible to the hole, leaving it to the golfer to finish out. Another was “phosphorescent” golf, in which golfers played at night with balls coated in glow-in-the-dark paint. Unfortunately, the chemistry of the 1870s was not up to snuff and on the first attempt one players’ glove reacted to the paint and ignited. Interestingly, there was a popular 1930s sport called “Codeball,” which sounds suspiciously like footgolf. The game was played on a fairway with fourteen bowls serving as the holes. A rubber ball six inches in diameter was teed off with a kick from the starting point and from where it landed was kicked again, the goal being to “hole” the ball with as few kicks as possible. It was simple and required little practice to play competently — perhaps a factor in its short shelf life, for there was very little challenge. There may be a lesson in that for those who think making the game of golf easier will make it more popular. I am convinced that one of the reasons golf is so addicting is that it tantalizes the player with glimpses of mastery, while ever holding it out of reach. Make it too easy, and golf (in any form) becomes something you do when you’ve got a couple hours to kill and nothing else more interesting (like playing Farmville on your phone). That mindset is NOT going to increase rounds. Fox Tossing is an easy read, and the format — 90 short articles — makes it perfect for the nightstand.